Vermont Reading Partners is a nonprofit volunteer literacy organization located in Manchester, Vermont and servicing southwestern Vermont and neighboring New York state towns. Vermont Reading Partners promotes literacy in southwestern Vermont and provides free and confidential tutoring for children and adults. We require all our tutors to complete a tutor training session in either the Adult/ESOL Program or the Student Program, depending on where the tutor would like to work. Our teaching methods are student-centered and designed for each individual's particular needs, goals, and learning style. In 1985 Rosamond Neilson founded the Pawlet Adult Reading Program in affiliation with Literacy Volunteers of America, now known as Vermont Reading Partners. At that time, it was the only volunteer program in the state of Vermont helping adults learn to read. Roz, as she was known locally, was tireless in creating a viable organization, assembling and training tutors, recruiting students, and making certain this new literacy group lived up to professional standards. Through her efforts, Vermont Reading Partners began tutoring adult students in southwestern Vermont and neighboring New York towns who wished to improve their reading skills. The services were free and confidential, a philosophy still vital to our organization today. During the late 1990s when businesses in our towns began to look for additional employees from outside of the country, the demand for teaching English-speaking skills in our area became apparent. In response, we began offering Adult ESOL (English for Speakers of Other Languages) tutoring services. We expanded our tutor training by integrating reading and writing skills with speaking and listening skills. In 1999 we expanded our services to include children. Our School Program is an after-school program that is offered in ten local elementary schools. In cooperation with the school's administration and teaching staff, we tutor students who are struggling with reading skills but do not qualify for additional help from state and federal programs. The personal attention these children receive help them become the independent readers they need to be successful in school. Also in 1999 we opened our first Free Book Swap at the Wayside Country Store in West Arlington. Thanks to community members who donate books, we can offer free books to the children and young adults who need books most. We now have ten locations. 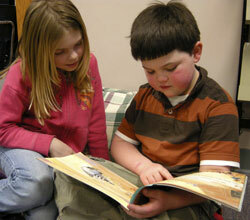 During 2005 we adopted a Family Program to encourage reading at home between children and parents and between siblings. Families are required to attend tutoring sessions together, and we include reading, writing, speaking, and listening skills. In May 2007 we successfully completed the yearlong accreditation process offered by our national organization ProLiteracy America, created from the merger of Literacy Volunteers of America and Laubach Literacy, another national literacy organization. This process insured the professional standards for management, tutor training, and student services we have held since our inception.